Another novel in a month? Today is the first of August. It is hot, steamy, and wet. It is raining. I am tempted to write a poem. But I remember what it said on one rejection slip: After a heavy rainfall, poems titled RAIN pour in from across the nation. I hate editing. I hate it so much. The problem is, I edit by hand, which makes for a two-step process. 2. I have to take those marked-up pages and type all the edits back into my novel. This is the part I really hate because I already spent all that time editing by hand and then I still have to transfer all the edits over. In a way, this slides a second round of edits in there, because as I take the handwritten edits and move them back to my computer files, chances are good I’ll change something all over again. But still. When I sit down to edit with the pages spread out before me and a pen in hand (today it’s pink; yesterday it was lime green), I’m already exhausted thinking about when I’ll carve out time to type all these edits up. So I hesitate and write a blog post about how much I hate editing instead of finishing with chapter 10 even though I’m halfway through and it’s going pretty fast and if I finish chapter 10 that means I can get started on 11, then 12, and then eventually I’ll get to the end and be through editing the entire book and who doesn’t want to get there? My pen and the paper are sitting here on my desk beside me, waiting for me to finish complaining. You might be asking yourself this: Sarah, why do you edit by hand if you don’t like the two-step process? I don’t know if I have a good reason for it really. Maybe it’s that I like seeing the edits form in front of my eyes (I poemed about this once) or that I like having a history of all my edits that doesn’t naturally happen on a computer screen with a lot of backspacing and deletions. Also, when I look at a computer screen to write or edit, I tend to let my mouse slip to Google Chrome and then fall down the BuzzFeed rabbit hole for an hour. 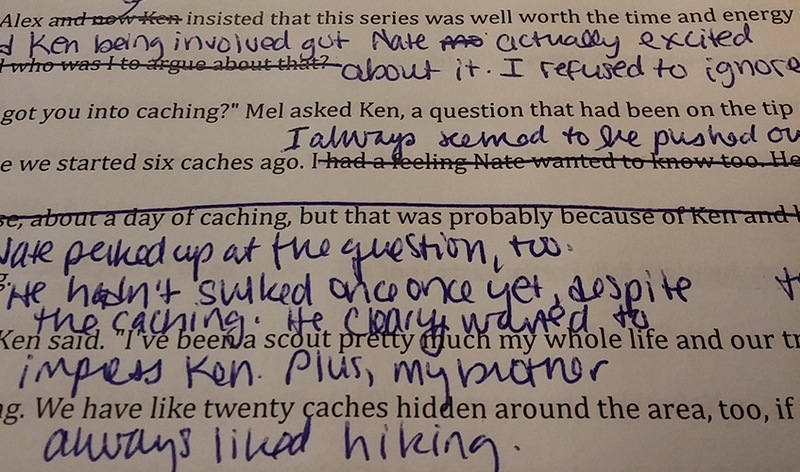 I know that aggressive editing is just another step in the ‘writing a novel’ process. I’ve done it before. I’m sure I’ll do it many times over again in the future. I just don’t like it. The book’s written. It’s not great but it’s good. I want to be done. I know that I’m not done. Even after multiple edits, the book isn’t the best thing ever written in the history of the world. But I just spend so much time on one thing that I want to move onto the next. That might be one of my beefs with editing. It’s preventing me from finishing. It’s another hurdle to jump before I can move on to the next thing. It’s keeping me in one world and one story. As it should. I know I still need to change everything a lot of things. Change the words, fill out the characters, sharpen the dialogue, delete scenes, add scenes, rearrange scenes, make the dang thing make sense. You know, the usual. That’s important at this stage. If I don’t do it now, I won’t do it. I’m really lousy at the whole setting something aside and returning to it months later with fresh eyes. I’ve managed it, to much success even, but by then I’m so far into something else (hopefully) that I can’t return. I know this isn’t a good thing. I’m sure a lot of my writing habits aren’t very good. I’m not sorry. But, really — can’t someone else type up all my edits for me? That’s all I ask. I get this. If I ever write a book, I’ll probably edit by hand too. WHEN you write a book, you mean!